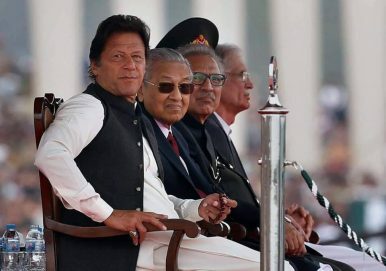 When Pakistan’s Prime Minister Imran Khan last met Malaysian Prime Minister Mahathir Mohamad, ample praise for each other’s election victories took center stage. A rich history of close cooperation – including Pakistan’s contribution to drafting Malaysia’s constitution – fueled prospects of a wide-ranging strategic economic partnership. But what constituted these “strategic interests” at the time remained unclear. Last week, that changed. The two premiers inked five memoranda of understanding in the areas of telecommunication, information technology, and power generation, while also bolstering cooperation across agriculture, banking, and energy sectors. Malaysia redoubled its interest in acquiring JF-17 Thunder jets from Pakistan. Razak Dawood, Khan’s Advisor on Commerce, estimated the signed deals at $900 million. Malaysian automobile company Proton also agreed to set up its first South Asian power plant near Karachi. Set to begin operations in June, the move lends impetus to Pakistan’s Automotive Development Policy (2016-2021), which in the past few months has induced production from Volkswagen and Hyundai, in a bid to internationalize the country’s automotive industry. These bilateral agreements enjoy strategic significance on two levels. First, they enable Malaysian companies to target investment possibilities in Pakistan’s Special Economic Zones (SEZs). These geographical units operate with lax industrial regulations, adequate infrastructure, and alternate power supplies, and were a key part of Khan’s investment proposal to Malaysian capitalists in 2018. The majority of these zones are also tied to the China-Pakistan Economic Corridor (CPEC), boasting strategic access to South, West, and Central Asia. Direct access to lucrative markets could play an important role in expanding Malaysia’s investment footprint in Asia. For Pakistan, improved bilateral trade with Malaysia means incentivizing an underperforming domestic industry. In his November visit to Kuala Lumpur, Imran Khan underlined a “four-pronged strategy” to set Pakistan’s economic deficit right: renewed foreign direct investment and increasing exports constituting its crux. Though Pakistani exports continue to lag behind regional competitors, foreign direct investment has seen periodic upticks in the country. Past months have seen multi-billion dollar credit and investment agreements with UAE and Saudi Arabia, with the latter committing$20 billion in energy, power and a petrochemical complex in the heart of Gwadar. Some of the region’s biggest online payment ventures have also ended up valuing Pakistan’s microfinance banking services at $410 million. However, FDI’s role in offsetting Pakistan’s soaring current account deficit is minimal. By capitalizing on Kuala Lumpur’s desire to attract defense sales from JF-17 Thunder jets and anti-tank missiles, Pakistan can establish an entry point into a burgeoning Southeast Asian trade ecosystem. A pivot toward East Asia could also diversify Pakistan’s Middle East-focused, Sino-centric foreign policy, especially when Khan continues to cite Malaysia as an export-driven success story in many of his appeals to the masses. Interestingly, Pakistan’s relationship with Malaysia enjoys symbolism that goes beyond just bilateral trade. This stems from a set of political tendencies that are true for both regimes. For instance, both Mahathir and Khan have chosen to formulate national interests that are free of international pressures: the former scrapping multi-billion dollar Chinese Belt and Road Initiative projects to protect a debt-ridden economy, while Khan looks to bolster bilateral credit deals to offset stringent IMF conditions. The same is true on a regional scale. Mahathir’s support for closer cooperation with the Association of Southeast Asian Nations has not softened his positionon Chinese influence in the hotly contested South China Sea region. Neither has Khan’s support for the U.S.-led Taliban peace talks limited his vocal opposition to U.S.-military interests in Afghanistan. Ultimately, both nations have stressed the need to convene the Malaysia-Pakistan Closer Economic Partnership Agreement (MPCEPA) Join Committee Meeting, at its earliest. It is the continuation of this type of urgency that will determine the path forward for both Malaysia and Pakistan, amid a rapidly changing geopolitical landscape. Hannan R. Hussain is a Pakistan-based journalist and writer.